Fr. Paul of Moll once remarked that life is full of crosses, and that the easiest path – and the most fruitful – is to do everything for the love of God. The Cross, writes Bl. Dom Columba Marmion, is the root of all fecundity. … [Edit] Recently, while in a difficult state, I felt inspired to send up a prayer to St. Therese and her family. (I have been reading the Letters of St. Therese in my spare time, and I must confess my love for St. Therese and her family; they are so pure in their faith, so affectionate, so simple, and so loving). 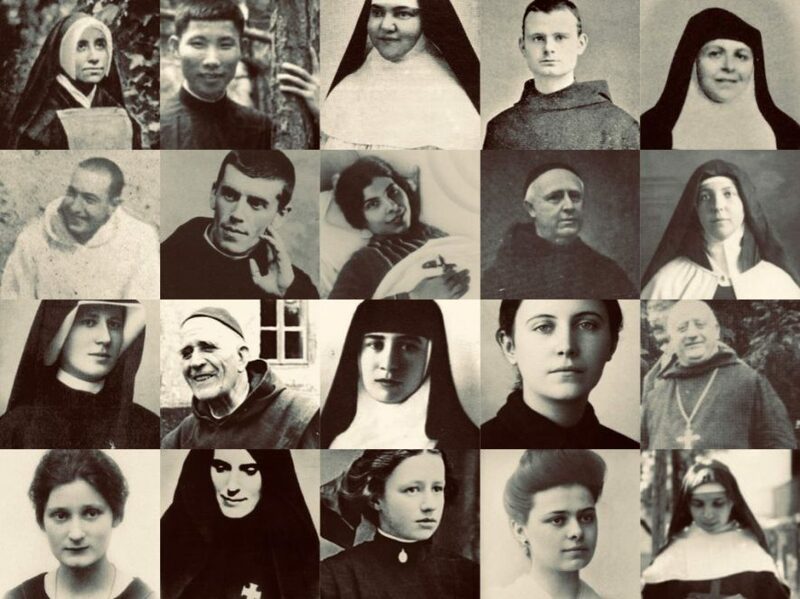 As I was lying on my bed one day, reading the Letters of St. Therese, I felt inspired to offer one year of Masses in honour of St. Therese, her recently canonized parents, and her entire family. Immediately after making this intention and offering it to God and these holy souls, I felt inspired to ask St. Therese and her siblings to adopt me as their little brother. I also asked St. Louis and St. Zelie to adopt me as their son. Then I forgot about it. The following day, I was in a Catholic library, which is home to some 3000 books (a rough estimate). I didn’t have much time for reading, so I picked up a random book that caught my eye, and started flicking hastily through the pages. A certain picture stood out. It was a beautiful photo of St. Therese and her family (actually it was a collection of photos that were framed under the heading, ‘Le Martin Familie’ or something French like that). I thought nothing of it at the time. It was only later than night that I recalled my prayer the previous day. Then I considered the likelihood of stumbling upon a picture of the Martin family… in a book about a Benedictine monk. “They have adopted me!” I thought. Now, you might think I jumped the gun a bit; but I experienced an overwhelming sense of joy at what seemed to be an answer to prayer. Then the thought occurred to me: “Why is there a picture of the Martin family in a book about a Benedictine monk? … I wonder if he asked the Martin sisters to adopt him?” I don’t know why, but I half-expected the this. I wanted to check the book to find the answer, but I had to wait another day. Long story, short: I was thrilled! Infinite Wealth? At What Cost? In Richard kelly’s movie, ‘The Box‘ (2009), a curious-looking man comes knocking on the door of a middle-class family. He is holding a box with a button inside. The couple let the man in to their house, and he explains to them that, if they are willing to press the button, they will receive one million dollars. The catch? Someone, somewhere, will die. (That is the gist; I won’t explain the whole plot). So, how does this question relate to the spiritual life? Consider this real-life example: A man is tempted to evade paying taxes; he owes the government a few thousand dollars, but if he “pockets” some of his cash, and doesn’t inform the government, he will save a few quid/bob/bucks/Benjamins/whatever! What does the man do? Suppose he takes the money; this would be an illegal and immoral act (the two are not necessarily the same!). Materially, he is guilty of mortal sin. If he acted with sufficient knowledge and consent, he is guilty of formal mortal sin (because the matter is grave). Is this not the height of insanity? Whereas in ‘The Box,’ the couple are offered one million dollars for the life of another [an unspeakable evil, no doubt], in the aforementioned example, the man is “offered” a few thousand dollars for the “price” of his own soul! Recall that every mortal sin makes us a slave to the Devil, and until we give up our sin, we are heading towards eternal damnation. That is a sobering thought, but it is must be known. If we are tempted to sin mortally, remember that the Devil can promise us nothing of true or lasting worth; he is all smoke and mirrors – pun intended. Pun regretted. On a more positive note, we should consider that, for every little act of love, there is an eternal reward (if we are in a state of sanctifying grace, the seed of supernatural fruits). Going back to ‘The Box,’ imagine the the same basic plot, but instead of being offered money, you were offered eternal joy (which often spills into earth); and instead of coming at the cost of another person’s life, the gift came by sincerely asking for it. Who would say no? People spend the greater part of their lives in pursuit of frivolous pleasures, when, all the while, Our Lord offers His grace to us at every moment. Whether we be poor or rich, sinful or virtuous, He offers us His friendship, His peace, His joy, and ultimately, Himself. Dear Jesus, hide me in you Sacred Heart, which was pierced for love of me! Never let me exit therefrom! One day, someone told St. Francis de Sales that they desired to become humble so that they could grow in love. The Saint replied that he preferred to aim at love in order to become humble. Who is correct? Why does this matter? One can verify this doctrine with ease; simply consider that God is Charity and Truth. This, then, is the litmus test of holiness or union with God: charity and humility. A soul might appear charitable and virtuous in the eyes of the world; but if they lack humility, their works are to that extent lacking in supernatural value. It is quite possible to donate generously to charity, serve the homeless, pray for souls, go to Mass, and read spiritual books, when, all the while, one is spiritually dead in mortal sin. Purity of intention is necessary. We will avoid delusion (to a great extent) if we offer our prayers, words and deeds to God, asking that He will act in and through us. He cannot fail to hear and answer such a prayer. We should always end our prayer with these words: “Thy Will be done.” I purposely capitalised the word “Will,” because God’s Will is not distinct from Himself, and therefore deserves to be adored (bearing in mind that God is the First Cause of all good, and merely permits evil). It is very easy for self-love to creep into our actions. We think that we are serving God, but the moment something doesn’t go according to plan, we get irritated, or we throw in the towel. Really, we should accept failure as we would success, and suffering as we would joy; both are fruitful, so long as our will is directed towards God, Who works all things to our good. If we are humble, we won’t be so surprised at our falls, nor will be so inclined to judge others, or to distrust, or to any other evil, all of which stem from the same root: pride. Because God loves us so much, and wants to lavish His graces on us, He often sends or permits humiliations of various sorts. Remember that sharp word someone addressed to you? God wanted it to be a means of sanctifying you. Remember that time you fell into impatience, despite your best efforts? God wanted you to humble yourself and rely more on Him. Remember that time you couldn’t focus during prayer? God wanted to let you know what you are without Him, and to reward your perseverance and patience. In all difficulties, we must remember that God wants us to be humble. Without humility, there is no union with God, no peace, no happiness, no salvation. By bearing humiliations we give God a precious gift; by acknowledging our misery, rather than rebelling against it, we draw God to us. He seeks only to give.